Hours: Brunch: Weekends 10am-3pm. Lunch Thurs & Fri 12pm-3pm. Intermezzo: Thurs-Sun 3pm-5pm. Dinner: Sunday-Tuesady 5pm-10pm, Wednesday-Saturday 5pm-12am. This little stretch of Bleecker Street has been home to our cheese shop for decades, but it wasn’t until we opened Murray’s Cheese Bar in 2012 that we could host our friends and neighbors for brunch, lunch, and dinner. Or cheese anytime of day! 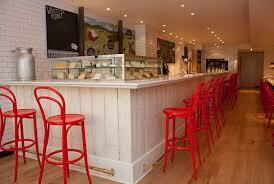 Our menu boasts cheeses plucked right from our cheese caves beneath Bleecker Street. Come by for a cheese plate you'll fantasize about later, or a full dinner of baked, grilled, melted cheeses and more, along with wine and craft beer.